For applications not requiring the two dimensional area of our InstaSpec™ CCD systems, but needing the versatility and superior resolution not afforded by our integrated minispectrometers, LineSpecTM Spectrometers are a smart alternative. Gratings and slits are interchangeable so you can re-define the usable spectral range and resolution, as your needs change. 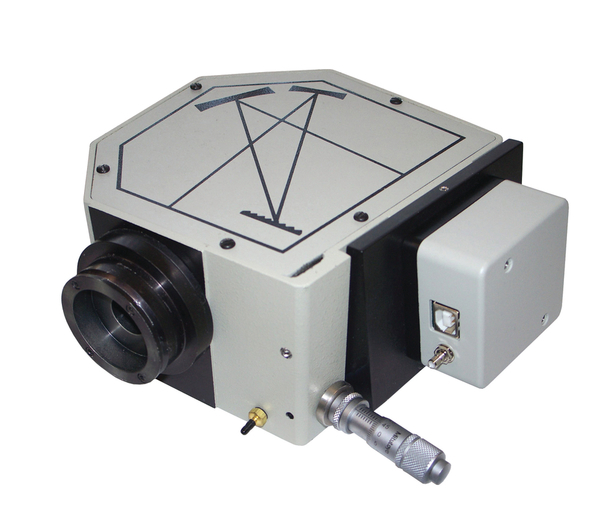 LineSpecTM Spectrometers are made up of our MS125™ 1/8 m Spectrograph and an external 2048 CCD or 1024 CMOS array. 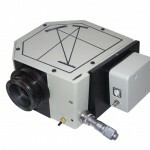 We also offer the array detectors separately, for mounting to other Oriel Spectrographs. What Makes up a LineSpec™ Spectrometer? We chose the MS125 as the spectrograph for these systems, because of its high resolution and throughput, economical price, and compact size. The MS125 is a micrometer driven, 1/8 m (120 mm), focal length instrument. Fig. 1 Quantum efficiency of CCD and CMOS Detectors. A key performance parameter determining the choice of CMOS or CCD is the maximum S/N achievable by the detector. Maximum S/N is achieved when the detector is close to saturation and the shot noise is much higher than all the other noises. For example, if one has a signal strong enough to saturate the well in the shortest exposure time, then the dark signal noise contribution is negligible, and as the readout noise adds orthogonally to the shot noise, it too has negligible contribution. To make a high resolution measurement of a signal level, a better S/N than the expected resolution of the measurement, is required. Consider trying to measure a 0.3% change in the intensity of a spectral line. Ideally, the S/N should be at least 5X better than the difference being measured and therefore a S/N of 0.3%/5 = 0.06%, or 0.06 in 100, which is 1667:1, is desired. One can only achieve this S/N level with a detector with a well capacity >1667 squared, i.e. >2,780,000 e. No CCD can achieve this S/N ratio in a single measurement, but a CMOS can. It should be noted, however, that a CMOS detector is less sensitive than a CCD so stronger signals are required with a CMOS than with a CCD. The key differences between the CCD and CMOS detectors are sensitivity and dynamic range. Because the CCD pixels are 2.9X larger than the CMOS pixels, the CCD sees 2.9X more light. The CCD’s much larger gain makes it 23.4X more sensitive. Overall, the CCD is 2.9 x 23.4 = 67.9X more sensitive than the CMOS detector. The CMOS detectors have a well capacity that is 24-30X greater than the linear CCDs, and so the signal to noise ratio of a CMOS detector ~4X greater than for CCD detectors. In short, CMOS detectors have application for high signal, high dynamic range and high S/N measurements, whereas CCD detectors are for low signal measurements. The LineSpec software (included with each spectrometer or stand alone array detector) is an intuitive instrument control and data acquisition software that runs under Windows 98/W2K/XP. The software supports routine spectroscopic measurements and data acquisition, such as: continuous, single and averaging scans; absorption, transmission and emission spectra; irradiance measurements. We also supply optional LabView Drivers and an OEM Development Kit. To ensure wavelength accuracy, we recommend using a known set of spectral lines, such as our 78822 HgAr Calibration Set, and letting the LineSpec™ software fit a standard quadratic regression through the known peaks. The 78822 includes a power supply, a mounting adapter to couple the lamp to the MS125™, and a HgAr calibration lamp. Fig. 2 Transmittance spectra of BG36 Schott Glass Filter taken with 78871 CMOS Spectrometer. The MS125™ Spectrograph used a 400 l/mm grating blazed at 500 nm, and a 50 µm input slit. Integration time = 50 ms, averaging = 1 and 500 (noted on the inset graph).